We find the evidence backed with research citations on why Cinnamon Spice maybe the solution for Diabetes, Candida, Weight loss, Cancer, Alzheimer's, Toenail fungus, Parkinson's, Stomach flu and much more. Take a closer look at the evidence. The benefits of cinnamon are compelling. This information is presented for informational purposes and is not intended to treat, diagnose or cure any illness. Consult a physician before taking any Cinnamon. 1.Blood Sugar Control – Several studies have found that Cinnamon has properties that help those with insulin resistance. It is therefore very popular with Type 2 diabetics who take it to control their blood sugar variations. Ceylon Cinnamon is particularly popular because it has low levels of Coumarin. compared to Cassia Cinnamon found in your grocery store. In case you did not know, Coumarin in high doses can cause liver damage. This study found Cassia Cinnamon was more effective than Ceylon Cinnamon at controlling blood sugar for a given amount of Cinnamon. An easy solution is to therefore double your dosage of Ceylon Cinnamon, since even doubling the dosage will not come close to the high Coumarin levels found in Cassia Cinnamon. In another study Ceylon Cinnamon was found to have an effect on blood sugar control in a rat model. There is also some evidence that it is the Cinnamaldehyde component of Cinnamon (commonly found in Cinnamon Bark Oil) that seems to be effective for blood sugar control. This study found it the most effective compared to berberine (Ber), and metformin (Met) at controlling blood sugar levels. Another study found Cinnamaldehyde from Ceylon Cinnamon Bark Oil (Cinnamomum Zeylanicum) reduced plasma glucose concentration significantly (p<0.05) in a dose-dependent manner (63.29%). 2. Candida Yeast Infections - Cinnamon has shown an amazing ability to stop medication-resistant yeast infections. This applies to Escherichia coli bacteria and Candida albicans fungus. This study discovered that Cinnamon Oil was one of three leading essential oils effective against Candida. A second study found that Cinnamon Oil was effective against three strains of Candida, Candida albicans, Candida tropicalis, and Candida krusei. 3. Stomach Bug/Flu - By far and away the best remedy for a horrible stomach bug is Cinnamon. It makes sense because Cinnamon is a powerful anti-bacterial. Research has shown Cinnamon is one of the most effective substances against E-coli, and Salmonella. as well as Campylobacter . Another study found Cinnamaldehyde from Cinnamon Bark Oil in its various forms is effective against adenovirus. Follow our instructions for stomach flu. 4. Irritable Bowel Syndrome (IBS) – As a digestive cinnamon dramatically reduces the uncomfortable feelings associated with IBS especially the bloating. It does this by killing bacteria and healing infections in the GI tract and enabling the gastric juices to work normally. A Swiss study showed that Ceylon Cinnamon Bark Oil has promising results for H. Pylori, a bacteria that causes Peptic ulcers and stomach cancer. But if you do have stomach cramps or upsets, a cup of Cinnamon tea 2-3 times per day may reduce the pain. Some people have asked if cinnamon gives you gas. No it does not. It actually helps reduce gas and bloating. 5. Cancer Preventer – Research shows that Cinnamon oil is a promising solution in the treatment of Tumors, Gastric Cancers and Melanomas. Research studies show that sugar maybe causing or sustaining cancer cells and cinnamon may have a mitigating effect by controlling blood sugar levels in the body. Another study found good results with leukemia and lymphoma cancer cells. Cinnamon in its various forms has two chemical constituents called Cinnamaldehyde and Eugenol (From Cinnamon Oil). These have been used to develop nutraceuticals in this study that have proven fairly effective in fighting Human Colon Cancer Cells (Eugenol) and Human hepatoma cells (Cinnamaldehyde). So the evidence seems to suggest that Cinnamon is starving cancer cells of the sugar needed to sustain them. This University of Arizona study found that the cinnamaldehyde component of cinnamon was a potent colorectal cancer fighter. 6. Arthritis/Osteoporosis – The widely cited Copenhagen university study is a hoax. Most of the evidence that Cinnamon helps arthritis is from personal testimonials. Some people claim drinking Cinnamon tea helps the pain from arthritis while others claim a Cinnamon Oil based massage oil helps ease the pain. A study in 2008 listed in this pdf found that Aldehyde components of Ceylon Cinnamon bark extract suppresses RANKL-induced osteoclastogenesis through NFATc1 down regulation. 7. Anti-Bacterial/Anti-Microbial - Both Ceylon Cinnamon Leaf Oil and Ceylon Cinnamon Bark are powerful anti-bacterial agents and makes a great natural disinfectant. Cinnamon oil had the best anti microbial activity among three oils against Escherichia coli , Staphylococcus aureus , Aspergillus oryzae , and Penicillium digitatum according to this abstract. Cinnamon Bark Oil is also an extremely powerful anti bacterial. This study found the cinnamaldehyde levels of cinnamon Bark Oil was effective against Listeria monocytogenes,Salmonella Typhimurium, and enterohemorrhagic Escherichia coli. One of the best research conducted is this study (pdf) out of France by Maynard et al which found Ceylon Cinnamon Bark Oil effective against 65 strains antibiotic resistant bacteria. Cinnamon is also one of the most effective E-coli fighters because of its anti- microbial properties. Mix cinnamon oil with hydrogen peroxide and spray your cutting board and kitchen sink especially after you have cut meats. Spray it in your refrigerator. It’s safe and natural. This study found a concentration of 2 microl/ml from cinnamon was enough to inactivate Salmonella Enteritidis, E. coli, and L. innocua in apple and pear juices and 8 and 10 microl/ml from cinnamon for melon juice and tryptone soy broth. Dilute either cinnamon oil with water to disinfect kitchen counter tops, sinks, your refrigerator, door knobs, toys and many other things. If you have young children and don't want to use harsh cancer causing chemicals use Cinnamon Oil. Cinnamon sticks are also a good anti bacterial but you would need a lot of it to make a difference. If you want a mild disinfect, like to wash your face, then a couple of Cinnamon sticks boiled in hot water might be an idea. 8. Food Preservative – Cinnamon seems effective in inhibiting bacterial growth. This maybe one reason why it is widely used in food preparation in hot Asian countries. In Sri Lanka, virtually every dish has a pinch of Cinnamon in it. In addition to great flavor, Ceylon Cinnamon in combination with other spices like Turmeric and Chili may have been an indigenous solution to preserve food without a refrigerator. This study for using Cinnamon Oil coated paper as a preservative found a 6% Cinnamon Oil solution was responsible for complete inhibition of mold in sliced bread packaging. This study listed on Feb 2013 also found cinnamon oil effective in developing insect resistant food packaging film. Cinnamon also came on top in this study, even against All spice and Clove Oil as very effective for making edible food film. 10. Alertness, Memory & Cognitive Development – According to this study by Dr. Bryan Raudenbush, Director of Undergraduate Research and associate professor of psychology at Wheeling Jesuit University in Wheeling, WV. Cinnamon may keep you more alert and decrease your frustration when you are behind the wheel. This hard to verify German study cited in this article those taking Cinnamon improved their response times and memory recall. While not scientific, our personal experience suggests pretty good results in alertness and concentration. In 2016 a Rush University study found that Cinnamon may aid learning ability. 11. 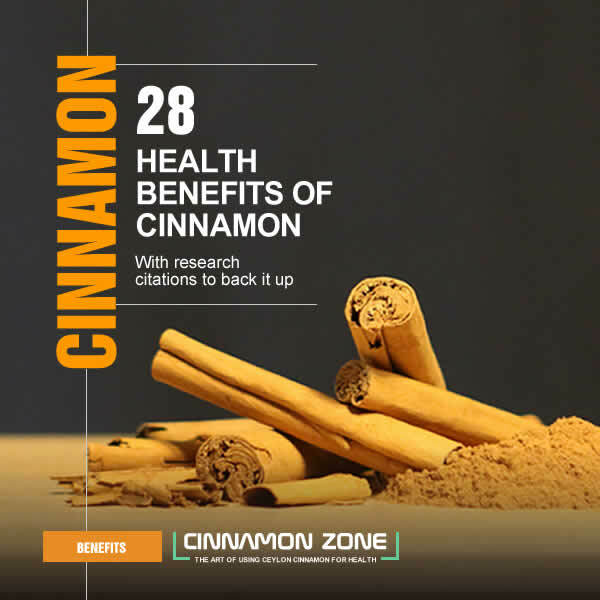 Anti-oxidant – With an ORAC value of 267536 μmol TE/100g (USDA 2007) cinnamon is one of the top seven anti-oxidants in the world. The suggestion is that Anti-oxidants reduce the formation of " Free Radicals " that cause cancer. This study found Cinnamon has sufficient anti-oxidant properties and makes for improved food palatability. This detailed Indian study (pdf) also found potential anti microbial and antioxidant properties of the volatile oils and oleoresins of cinnamon leaf and bark. But consider anti-oxidants as good for your whole body, repairing some of damage to virtually all parts of your body from skin to organs. 12. Weight Loss – Cinnamon apparently has the effect of thinning your blood thereby increasing blood circulation. Increased blood flow generally boosts your metabolism which is why it may be helpful in weight loss. This blood thinning property of Cinnamon also helps it in acting as an anti clotting agent especially for those suffering from heart disease. Care must be taken not to mix Cinnamon with other blood thinning medication. The main ingredient that causes your blood to thin is Coumarin which is present in high doses in Cassia Cinnamon (0.4%-0.8) but not in Ceylon Cinnamon (0.02%). However Coumarin causes liver damage. So taking Cassia Cinnamon for weight loss may end up causing liver damage. 13. Massage Therapy – Cinnamon is a well known warming agent. Combined with a carrier oil it is highly effective in relaxing and relieving muscle pain. Some put a few drops in their bath to relax and to sooth tired and aching muscles. 14. Toenail Fungus – Got a bad case of the toenail fungus or athletes foot? Cinnamon Leaf Oil is a powerful anti-fungal far superior to commercial topical treatments. You can use Cinnamon sticks, tea or powder for internal treatment and a few drops of Ceylon Cinnamon Leaf Oil and soak your feet to treat the toenail fungus or athlete's foot. We give you complete instructions here. 15. Lowering LDL cholesterol & triglycerides – According to a Mayo clinic article the only possible way Cinnamon could lower cholesterol is indirectly via how the body processes sugar and fat. But there is no direct effect on cholesterol. Still another study in Pakistan found Cinnamon reduced triglyceride (23-30%), LDL cholesterol (7-27%), and total cholesterol (12-26%). A review in 2011 found the consumption of cinnamon is associated with a statistically significant decrease in levels of total cholesterol, LDL-C, and triglyceride levels, and an increase in HDL-C (the good cholesterol) levels, but qualified it by saying that applying it to patient care is difficult. Still, worth a try in our book. 16. Acne - Cinnamon is hot and spicy and helps draw blood to the surface of your skin to help heal acne. Some of the causes of Acne is high sugar levels and Candida which cinnamon addresses spectacularly. Nutrient absorption is another cause and Cinnamon enables better nutrient absorption by delaying gastric emptying. Last not least Cinnamon can bleach out acne scars and dark patches. 17. Tooth Decay and Gum Disease – Again the anti-bacterial properties of Cinnamon may play a crucial role in getting rid of harmful bacteria without damaging your teeth or gums. It’s one of the reasons that Cinnamon Oil is often used in chewing gums, mouthwashes, toothpaste and breath mints. 18. Nutrients – One teaspoon of Cinnamon Powder (a realistic dose) has Manganese - 0.33mg (16% DV), Iron - 0.76 mg (4% DV), Calcium 24.56 mg (2% DV). Manganese apparently works as an enzyme activator and plays an important role in building good bone structure and bone metabolism. According to WebMD manganese is therefore useful for weak bones (osteoporosis), a type of “tired blood” (anemia), and symptoms of premenstrual syndrome (PMS). 19. Insect Repellent – The anti-microbial qualities of Cinnamon Leaf oil is often used for head lice treatment, black ant control, bed bugs, dust mites, and roaches. It is well known as a defense against mosquitoes'. This WebMD article sites a Taiwanese study which found that it not only kills Mosquito larvae but also acts as a bug repellent. This paper suggests that real Cinnamon Oil as opposed to Cinnamon extract is the best for a broad range anti-microbial activity. 20. Cold, Sore Throat and Cough – At the first sign (within 5-10 minutes) of sniffles or an itch in your throat take some Cinnamon Tea or Cinnamon stick Tea. It is said to stop an impending illness in its tracks. Again this may be related to the anti-bacterial properties and warming properties of Cinnamon and its propensity to increase blood flow and thereby improve blood oxygen levels to fight illness. Chinese traditional medicine commonly recommends Cinnamon for phlegm coughs. 21. Alzheimer’s Disease – This article cites an Israeli study done at the University of Tel Aviv that found sufficient evidence to conclude that Cinnamon can delay the effects of five aggressive strains of Alzheimer's inducing genes. Another study also finds that orally administered Cinnamon extract has had good success in correcting Cognitive Impairment in Alzheimer's Disease in Animal Models. 22. PMS - Again because of the high levels of Manganese Cinnamon may be an excellent candidate to mitigate the effects of PMS. According to the University of Maryland web site women who ate 5.6 mg of manganese in their diets each day had fewer mood swings and cramps compared to those who ate only 1 mg of manganese. These results suggest that a manganese rich diet may help reduce symptoms of PMS. Another clinical study found that 46 patients with PMS had significantly lower amounts of calcium, chromium, copper, and manganese in their blood. You should not consume more than 11 mg of Manganese per day (about 12 cinnamon sticks) according NYU. 23. Depression/Reduced irritability/Mood Enhancer - Ancient folklore says the smell of Cinnamon is the best cure for the winter blues. The only scientific evidence we can find to support this theory is this study by Dr. Bryan Raudenbush, Director of Undergraduate Research and associate professor of psychology at Wheeling Jesuit University in Wheeling, WV. The study found that the scent of Cinnamon reduced driver irritability. But Cinnamon may be an excellent cure for depression in a more roundabout way. There is some evidence that certain types of gut bacteria may make you more susceptible to depression. Cinnamon as a powerful stomach anti-bacterial may help you remove the bad bacteria. However since Cinnamon removes both bad and some good bacteria from your stomach you would be advised to repopulate your body with good bacteria by drinking a good probiotic or eating fermented food after taking Cinnamon. 25. Parkinson's Disease - Although very little research has been done on Cinnamon as a solution for Parkinson's disease, Cinnamon should present an exciting possibility. This July 2014 study by Rush University Medical Center found that using cinnamon can reverse the biomechanical, cellular and anatomical changes that occur in the brains of mice with Parkinson’s disease (PD). 26. Cinnamon and ADHD - Some parents are beginning to use Cinnamon as a supplementary treatment option for their children with ADHD or ADHD like symptoms. The best known study of issue is this study out of Taiwanese study which used cinnamon oil aromatherapy. 27. H. Pylori - This study shows together with Ceyon Cinnamon Bark Oil was one of the most effective against . Helicobacter pylori (H. pylori) is a type of bacteria. This bacteria while mostly harmless live in your digestive tract and can cause ulcers, in the lining of your stomach or the upper part of your small intestine. In the study Ceylon Cinnamon Bark Oil was second only to Carrot seed oil in terms of it;s efficacy. While the study does not indicate the level of Cinnamaldehyde, we feels a Ceylon Cinnamon Bark Oils with a minimum of 60% Cinnamaldehyde could have beaten the Carrot seed oil to first place. 28. Multiple Sclerosis (MS) - This discussion paper and experiment using found Cinnamon presents a good option for treatment of MS. Yet again it finds that Cinnamaldehyde found in Ceylon Cinnamon plays an important role in how Cinnamon works for MS.